"But really, when it comes down to it, you determine what goes into your mouth, and it is a shame to squander that control." Andrew Weil, M.D., teaches alternative medicine, mind/body interactions and medical botany at the University of Arizona in Tucson. A graduate of Harvard Medical School, he is considered a leader in the integration of Western and alternative medicines. While his work is revolutionary, it is based on common sense nutrition, and this video offers the dietary and lifestyle fundamentals to live a long and healthier life. I have learned a lot from this good doctor, and admire his dedication to championing alternative medicine in this age of the Western medical behemoth. This particular video is a companion to the book of the same title, and is aimed specifically to those people who need a nudge to remind them of the evils of fast food and fad diets. The program is in 2 parts. Section one, Eating Well For Optimum Health (58m:00s), is the main focus, most concerned with daily nutritional lifestyle. His main message here is the balance of macronutrients (carbohydrates, proteins and fats), physical activity, breathing and sleep. While you may think you've heard these things before, he does take us more in-depth as to why these things are necessary. He does share some things you may not know, such as how microwaves drive plastic molecules into our food (hence, never use plastic in a microwave! ), why pasta should be eaten al dente and why egg yolks are important in our diets. Section 2: "Additional Material" (23m:26s) goes further into the micronutrients (vitamins, minerals, fiber and "phytochemicals"—important plants compounds). This second talk is one I found more interesting and innovative, describing how our bodies use these chemicals to fight off our major Western diseases. One unusual gem we can learn here is how our bodies cannot make use of anything more than 200mg of vitamin C a day. While the book is obviously a more complete study, this visual aid serves as a quick reminder for that information, and much can be gleaned from it for those who probably would not read the 300-page book. There is plenty of good, easy to understand information imparted by this convivial, somewhat round but glowingly healthy man. 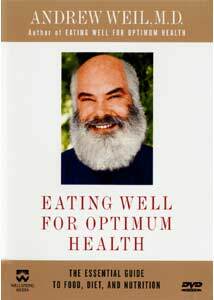 Dr. Weil is a delightfully clear speaker, and does manage to bring his scientific data to a place we can comprehend and therefore use it. Image Transfer Review: The source video is fresh and therefore stunningly bright and clean, shot live on location at the Enid A. Haupt Conservatory at the New York Botanical Gardens in the Bronx. Andrew Weil has a natural presence, one can easily imagine being right there in the audience. The contrast is a bit high, shadows too black and fleshtones a bit washed out in the studio lighting. Overall, not a speck to be seen, an excellent transfer. Audio Transfer Review: Even and clear, all in the front speakers—no effects or theatrics here. Again, this is very recent material, so there is little or no loss from the original audio recording. As there is nothing to this Dolby stereo track but Dr. Weil's dialogue and scattered audience applause, it is more than sufficient. Extras Review: The recipes are the "meat" of the extras here, with 6 suggested combinations for delicious, healthy eating excerpted from the book. There are quite a few links to websites varying from the publishers to where to buy sea vegetables, and the suggested reading list consists of other authors' work on related subjects. It would have been nice to have lists of Weil's main topics, and some reference notes on his suggested percentages for his optimum diets. I am a fan of Dr. Weil, mainly his study of herbs and botanical extracts. As someone who has never fallen prey to the siren song of fast and convenience foods, there wasn't much personal gain for me in the main body of this talk; I found the shorter second section to be of much more value. But if you dine at the drive-thru window more than once a week, there is plenty here for you to digest. Recommended.